When an emergency strikes, you will want to be prepared to handle a dental situation in a timely and efficient manner. Most people are unaware that there are emergency dental clinics and offices in their city that provide after-hours offices or even 24-hr services for those in a dental crisis. We’ve made it easier for you to be prepared and find relevant information when you need it quickly, with our list of qualified dentists who offer emergency services. Don’t be left in a situation where you are unsure of where to seek treatment or considering postponing until regular office hours. Instead, seek out emergency care by calling our referral number to quickly receive a list of all available dentists in Atlanta, GA. An after hours clinic or 24-hour dentist can provide you with quality treatment to get back to feeling like your old self again. Emergency Dentists USA found a Saturday dentist near me when I needed it most. I was able to get in to see an emergency dentist and out of pain quickly. I am so happy I found this site. For those local to Atlanta and those just traveling through, there are a variety of options to choose from when it comes to receiving emergency dental care. With many different emergency dentistry options in Atlanta, you don’t have to worry about not having professional, quality care available in your time of need. Most offer call in emergency Saturday & Sunday dentist services, which allows you to call in and speak to a qualified dentist and schedule an immediate appointment. Atlanta also offers many after hour clinics and dentist offices that have additional service availability after normal business hours. The benefits of after hours clinics are that they not only provide you with the ability to see a professional dentist during an emergency situation, but also allow you greater flexibility when it comes to scheduling a dental appointment. If you find that you or your family member are in a situation where you may need emergency dental services, it’s nice to know that there are many available options in Atlanta at your disposal. “Unless you have sustained an injury to your face or have a broken jaw, it is best to avoid going to a hospital emergency room for a dental problem. Emergency rooms are staffed by physicians who are not trained or equipped to handle common dental problems such as toothaches, broken crowns, loose bridges, or fractured teeth. When you are in a situation that requires immediate dental treatment, it’s always best to be prepared. Trying to figure out what options you have available to you in a time of stress can make things even more complicated. We’ve taken the hassle out of determining where to go when you are in a dental crisis. Below you will find a list of emergency dental services and after hours clinics located in Atlanta, Georgia. You can review the listings to find a qualified dentist and treatment center that is located close to you so that you are familiar with your available options for emergencies. Description:You will receive a list of emergency dentists that have 24/7 dental care in Atlanta depending on your area in the city. Usually, you’ll receive the closest office first and then each office afterward is a bit farther away. A great place to find Atlanta emergency dental care with or without insurance. 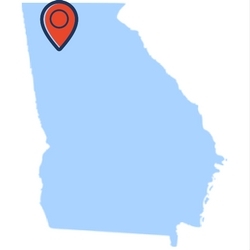 Easily find Georgia emergency dentists with our service. Description: Atlanta’s dentist works hard 7 days a week to provide you with the opportunity to have a dentist available on weekends, as well as after hours dental care on weeknights. They have excellent Atlanta Sunday dentist hours which vary each week. With these extended hours and weekend availability, you can’t go wrong by chosing Atlanta’s Dentist as your emergency dental clinic. Description: This dental healthcare team is ready for you day or night. With dental professionals available day or night at their 24/7 dental care clinic in Atlanta, you receive all of the services you would expect from a regular dental office that has normal business hours. They are kid-friendly and are committed to helping children understand the importance of good dental health. Description: Located in the heart of Atlanta on Carnia Drive, this is an excellent choice for an emergency dental location, as it is open two Saturdays a month. This practice understands completely that tooth and gum pain can really catch you off guard, and they will treat your emergency with a great amount of diligence and personal interest. Description: Because they are open Monday to Friday from 7am til 7pm, Pure Dental Health is a great choice for an urgent care dentist in Atlanta. Their weeknight hours open til 7pm means any day of the week you can get in to see their walkin dentist specialist after work every night! Description: Atlanta Dental Care provides a fantastic service and has a very comfortable office. Their staff will treat you like your family! If you’re struggling to find a weekend dentist in Atlanta, this is the place you should call. Description: The best asset of this Atlanta emergency dentist is that they are here for you seven days a week! One of the hardest things to find in this busy city, this clinic also participates in Care Credit, making it easier to finance the treatment you desperately need. The staff here will accept walk-ins, so when your abscess or otherwise aching tooth is getting worse and worse, you can find immediate comfort knowing the staff is welcoming you here. Root canals, extractions, and attention for severely aching teeth are a few of the services that you can obtain here at Tucker Dentistry. Visiting an emergency dentist in Atlanta, Georgia is similar to visiting your typical dentist office. If you make an appointment and are not a walk in visitor, ensure you arrive at least 15 minutes prior to your scheduled appointment. This will allow you to fill out any necessary paperwork and speed up the process of your emergency treatment. While we’re not always expecting an emergency to arise, be sure you have a payment method in mind before your appointment on the off chance the emergency dentist does not take your form of insurance. Additionally, it’s always a good idea when seeing a new dentist to have any necessary dental records with you so that they can catch up on your prior treatment. Make sure to alert your dentist of any allergies you may have to medications or any adverse reactions you have had in the past. There are numerous situations that may arise that are considered a dental emergency. Below we discuss some of these situations that may arise and some home remedies you can try before you are able to get into an emergency dentist in Atlanta. If you are experiencing any of the conditions listed below, it’s important to seek treatment immediately. A dental abscess can be one of the worst pains that someone can experience because it is from an infection of the tooth or gums. When a dental infection in the mouth occurs it’s important to have it promptly examined by a dentist. An infection in your mouth can spread to nearby tissue which can create potential complications throughout the body. To help alleviate discomfort and pain associated with a dental abscess, you can try rinsing your mouth with a warm salt water solution. Using a mixture of ½ teaspoon of salt in 8 ounces of water, rinse your mouth out completely. This can help to provide you with temporary relief until you are able to see an Atlanta, Georgia emergency dentist. 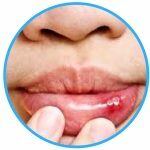 The soft tissues in your mouth including areas such as your gums, cheeks, lips, and tongue are especially sensitive and can bleed very easily when injured. If you experience severe bleeding during a soft tissue injury it’s important to minimize and control the bleeding as soon as possible. To do this you can rinse out your mouth using a mild salt water mix. If you notice that this does not help to slow down the bleeding, using a piece of gauze that is moistened or a wet tea bag can help as well. Be sure to apply pressure to the area and keep it held there for at least 15 seconds. Controlling the bleeding is the first step with any soft tissue injury. The next step is to get in contact with an emergency dentist or walk in clinic to be seen as soon as possible. It’s not uncommon to have a crown become loose or lost, sometimes it can easily happen when eating. When a crown comes off of the tooth, the affected region can become sensitive to any pressure or even the slightest temperature change. Crowns typically start to become loose when the tooth below it is decaying. The decay of the tooth can cause it to become misshapen, which in turn can cause the crown to not fit as well. Until you are able to see the dentist, keep the crown in a cool location. This can help to preserve the crown in the event that the dentist is able to reinsert it in your mouth. When the crown is out of your mouth for a long period of time, your teeth can shift or can become susceptible to even further damage. Until you are able to see a dentist, you can alleviate pain associated with the lost crown by applying clove oil to the affected region. Try placing dental cement into the space where the crown once was to protect the exposed tooth. It’s important to remember that you do not place any type of glue to try to reattach the crown, as this can cause further damage to your tooth. Your teeth are strong but that doesn’t mean they are invincible to any cracks or breaks. 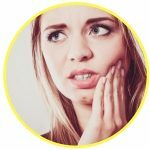 Sometimes minor breaks or fractures can appear to be painless, but if it happens to extend down into the root of the tooth, this can cause intense pain. There are many different forms when it comes to cracks or fractures in a tooth. 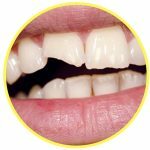 Typically, the most common cracks or fractures are caused by biting and grinding of teeth. 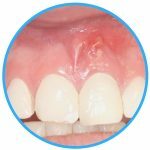 When you fracture or crack your tooth there is no other method of healing it other than seeing an emergency dentist in the Atlanta area as soon as possible. Until you are able to get seen by a dentist, you can rinse off the tooth with lukewarm water, place gauze on the affected region, then place a cool damp cloth on your cheek to reduce the pain and swelling. Try using an over the counter or topical pain reliever to alleviate any pain associated with the tooth. A tooth extraction becomes a necessary procedure due to many different reasons. One of the most common reasons is an impacted tooth in the mouth. This happens when your tooth stops growing in a normal pattern and starts to become swollen and painful. Wisdom teeth often times take on an unusual growing pattern and require extractions for proper removal. Sometimes your mouth can become too crowded, and because of this additional room in your mouth may be required. Extractions may be necessary immediately to help reduce your chances of developing an infection, or having an infection spread. An emergency dentist has the experience necessary to help relieve any pain and discomfort associated with a tooth that needs to be removed. Some tooth extractions can be completed by using only numbing cream on your teeth and gums. However, sometimes it may be necessary to be sedated with nitrous oxide to help aid with the discomfort and pain that comes along with having a tooth extracted. Prior to having a tooth extracted, you will want to avoid eating or drinking anything in the hours leading up to the surgery. It’s also important to have someone available that can drive you home once it is completed. Placing ice packs on the affected region can help to alleviate pain and swelling after the extraction is completed. Swelling and pain are a normal part of the healing process. This should start to ease up within a few days to weeks after the initial extraction. When you encounter a dental emergency, it’s important to understand the type of treatment option that may be best for you. Dental emergencies should be handled quickly to ensure you avoid infection, loss of your teeth, or even something more serious. Any emergency that involves your face may actually require the services of an emergency room. Conditions involving fractures, dental abscesses, or soft tissue injuries often times require treatment options that an emergency room is best equipped to handle. Those that suffer from chronic illnesses or other immune system conditions using an emergency room may be the best choice for you. While emergency rooms are equipped to handle many types of emergencies, dental emergencies often times should be handled at a dentist’s office. Dentists understand the mouth and its anatomy much better than doctors that work in an emergency room because they specialize in it. When it comes to ensuring your smile stays healthy and bright, you should always try to be prepared for anything. Waiting until your dentist’s office to open is not always a good choice for many different dental emergencies. Postponing necessary treatment can end up leading to additional damage and pain in the future. Using an emergency dentist may be the best option for certain situations and Emergency Dentists USA has you covered for any type of dental emergency, with one phone call to our free referral service!. Remember that it’s important to check with your local dental society and quickly find out any information you can about a potential new dentist.